This is our stunning Moonshadow Coat! It's made from steamed velvet. It's long, it has a full pointy hood, and fastens at the front with three little frog fasteners. The coat is fitted at the waist, then flares out for a fab swooshy hemline! 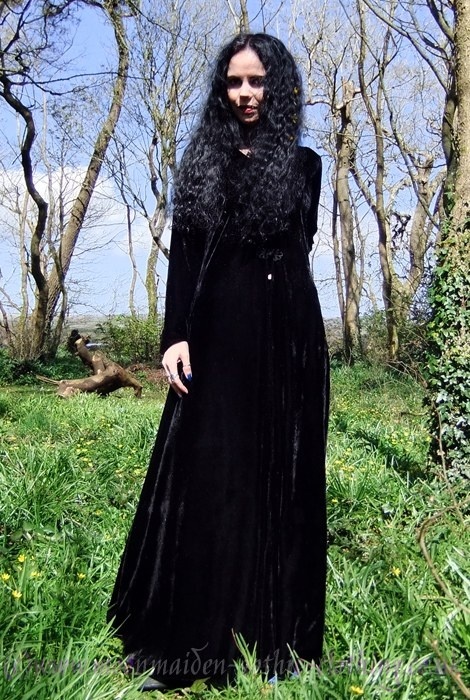 Perfect for rituals, handfastings, or just throwing on on a cold winters day cos you want to look gothily gorgeous :D It's available in all of our steamed velvet shades.